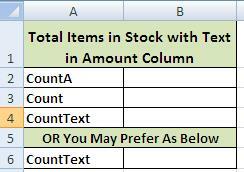 How to count text in excel 2003 2007 2010? Excel has Count Function that counts data rows where cells contain digit or numeric cells in the column on which this formula is applied. 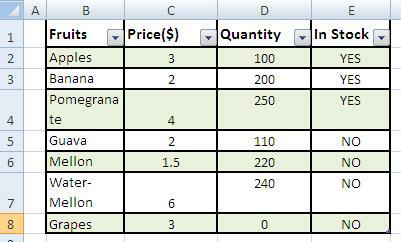 Excel has CountA function to count all non-blank cells in a column. 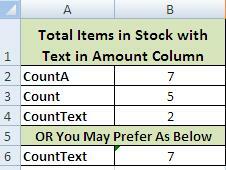 In other words no direct formula is not available for counting of text values in cells. Hence, this method may be adopted as stated in below steps. (b) Formulate your tables: these may be on the same table or on a different worksheet or even different workbooks. (c) For the sake of example we have created two Tables. (e) Table where data is to be fetched/desired. Ensure spellings for search values are the same in both the tables. Make sure there is no extra space. 1. You may copy and paste Count formula anywhere within the same sheet or even workbook for counting numeric or digit values in any column of any worksheet. 2. A really swift and smooth process for finding and counting of blank entries across the sheets and workbooks with ease and perfection.